Millions of people have faced travel disruption during a 48-hour strike by Tube staff in London. The strike began at 1859 BST on Tuesday after talks broke down between London Underground bosses and the Rail, Maritime and Transport (RMT) union. Nine lines are affected by the industrial action, although there is said to be a normal service on the Northern and Jubilee lines. Docklands Light Railway and London Overground are operating as normal. Some train stations have been inundated with extra passengers, with Clapham Junction severely overcrowded and hundreds of people queuing on to the street. 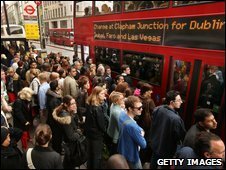 Extra traffic on London's roads has also resulted in gridlock in some parts, with buses struggling to stick to normal timetables. Ten hours of negotiations on Tuesday failed to bring about a deal between the RMT and Transport for London (TfL). The dispute is over pay, jobs and disciplinary issues. In an open letter, RMT leader Bob Crow accused London Mayor Boris Johnson of "playing politics" over the Tube to further his own agenda. In the letter he said: "I have never experienced such dishonesty from any management that I have dealt with" and urged the mayor to agree to "direct face-to-face talks". Mr Johnson said the claims were "completely untrue". Joining commuters at a river ferry at Westminster on Wednesday morning, he told the BBC's Today programme that the RMT's leader Bob Crow had walked away from an excellent deal. He said the two sides were "within a whisker" of reaching an agreement and that it was "absolutely crazy" to go ahead with the strike. "Given that Londoners are enduring a partial, very, very irritating, unnecessary and misery-making Tube strike, I think he should send his negotiators back to the table where he will find a very good deal. "It's absolutely essential in my view that people of goodwill get round the negotiating table in the next few hours. "Some services are, in fact, running this morning - which I think underlines the fragility of the strike." However, Mr Crow, who joined a picket line outside Seven Sisters Tube station in north London, told Today that any possible deal had been scuppered by management. He said: "Acas officials went off to get the document typed up and by the time they came back the Underground management had reneged on it. "The whole thing stinks of last-minute sabotage and the RMT believes that must have come from the very top, and the finger is pointing at Boris Johnson and transport commissioner Peter Hendy. "Johnson needs to stop the political grandstanding and meet direct with RMT to settle the pay, jobs and bullying issues at the heart of this strike." Meanwhile, TfL said about 100 extra buses had been made available and a free river shuttle service was also on offer. Escorts are also leading cyclists across the capital and extra parking is in place for bicycles, while TfL has introduced a taxi-sharing scheme at all major railway stations. Despite the walkout, TfL said a normal service was running on the Northern and Jubilee lines, while there was a reduced service on other routes. TfL said it was running 120 trains - a quarter of the total trains on the network - while the capacity on the ferry service between London Bridge and Tower Bridge has been increased to 8,000 people an hour, compared to 1,000 on a normal day. Commuter Leslie Jarrett said "hundreds of people" were waiting for buses at Paddington. "The situation was not easy as probably 85% of those waiting did not have a clue what bus to take." Cyclist Jim Faircloth said: "The increased road usage of people in cars panicking about getting to work has made cycling more dangerous - I saw one accident and was nearly knocked off by car." England's World Cup qualifier against Andorra at Wembley Stadium will go ahead on Wednesday evening, despite concerns for the safety of fans travelling to the game. Chiltern Railways announced its services would not stop at Wembley Stadium Station after 1200 BST on Wednesday for safety reasons. London Overground services will also not stop at Wembley Central or North Wembley stations after 1800 BST because of the strike. The closures will leave many of the 70,000 supporters forced to travel by car, even though there is a lack of parking in the area. Last week, the Football Association stopped ticket sales for the game with some 20,000 left unsold. About three million people use the Tube network every day. The London Chamber of Commerce has said six out of 10 firms in London have been affected by the strike which will cost the London economy about £100m.